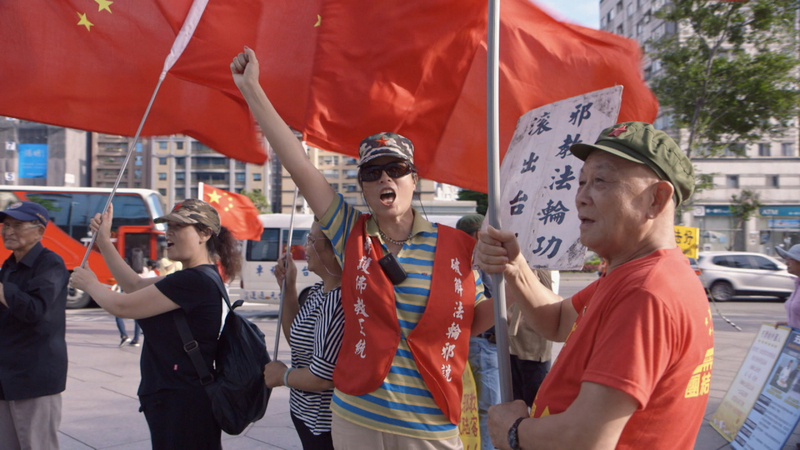 As Taiwan comes under increasing military and diplomatic pressure from China, pro-unification groups in Taiwan are intensifying their battle to win the hearts and minds of the Taiwanese people. Outside Tapei 101, one of Taiwan’s most famous landmarks, a group wave Chinese flags. “Long live the Chinese Communist Party,” they shout in unison. The flag bearers are members of the Concentric Patriotism Alliance (CPA), a group which supports the unification of Taiwan with China. Since 1949, China has fought against international recognition of Taiwan. Now there are growing fears that the Chinese Communist Party is attempting to sow dissent domestically by supporting pro-unification groups in Taiwan. “Over the past two years we have faced increasing pressure from China as they threaten our democratic way of life,” says Tsai Ing-Wen, the President of Taiwan. Speaking to an undercover reporter, the de factor leader of the CPA Zhang Ziuye explains how her organisation circumvents rules designed to stop groups from receiving funding from the Chinese government. “Authorities in China know which businesses support unification. They’ll do their best to make sure you don’t lose money.” Meanwhile Taiwanese public opinion on China remains divided, meaning Taiwan's leaders will need to strike a delicate balance in a time of heightened tensions.